Rub the butter and lard into the flour until the mixture looks like fine breadcrumbs. Mix with a SMALL amount of cold water until it just sticks together to form a dough. If it is crumbly add a few drops more water, if it is sticky add a bit more flour. Roll out on a floured work surface and line a 7” diameter (approx 18 cm) flan ring or flan tin. (Or you could buy ready-made pastry or a ready made tart case if you prefer). Beat the eggs and sugar together in a heatproof jug or bowl. Heat the milk until it is not quite boiling. If it does come to the boil, just take it off the heat and wait for the bubbles to subside before proceeding. Pour the hot milk slowly onto the eggs and sugar, beating continually with a wooden spoon as you add the milk. Stir in the rum, if using. It will probably look like slightly eggy milk at this stage and won’t have thickened noticeably. Don’t worry. Pour it into the flan case and sprinkle with grated nutmeg. It doesn't expand noticeably during cooking, so you can fill the flan case nearly to the top without fear of it boiling over. Bake in a moderate oven approx 170 C for about 30 minutes until set. Serve hot, warm or cold, with cream if liked. You can also bake the pastry case blind, if you wish. In which case, bake the pastry case blind for about 10 minutes in a hot oven approx 200 C, then pour the custard mix into the cooked pastry case and bake in a moderate oven approximately 160 C for about 30 minutes. Either method works well. I expect to get 6 or 8 slices out of this recipe, but that depends on your appetite. It will keep quite happily in a fridge or at room temperature (provided it isn’t too hot) for two or three days. Perfect timing, I just bought rum! 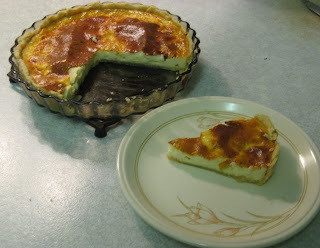 I enjoy custard tart, but my immediate family all hate it - it's the texture. If I make a quiche with the custard style of filling rather than the firmly set, they all mutiny too, so I'll just have to admire and wish bon appetit from afar! It's one of our earlier forms of tarts isn't it as far as I recall. Hello Lady D and welcome. Hope you enjoy it! Yuuum! That looks delicious. Once again you've given us a great recipe to try out! Meghan - I aim to please :-) Hope you enjoy it, if you try it out.